* Malignant disease: particularly mesothelioma and lung cancer. The three main types of asbestos that have been used commercially are crocidolite (blue asbestos), amosite (brown) and chrysotile (white). All fibre types are dangerous. There was discussion in the literature that blue and brown asbestos were more dangerous than white. There is, however, sufficient evidence to suggest that chrysotile can be as carcinogenic as the other types. Asbestos is a naturally occurring fibrous mineral often found in insulation materials around pipes and tanks, in tiles and other building materials. It was used extensively in the 1970s because of its strength and heat resistance. White, blue and brown asbestos are all potentially dangerous and have all been banned in the UK. This is become if asbestos is damaged, the fine fibres become airborne and can be inhaled. When these fibres penetrate the lung tissue, they trigger an inflammatory reaction. The body recognises there's a problem and sends defensive white blood cells to engulf and attack the fibres. 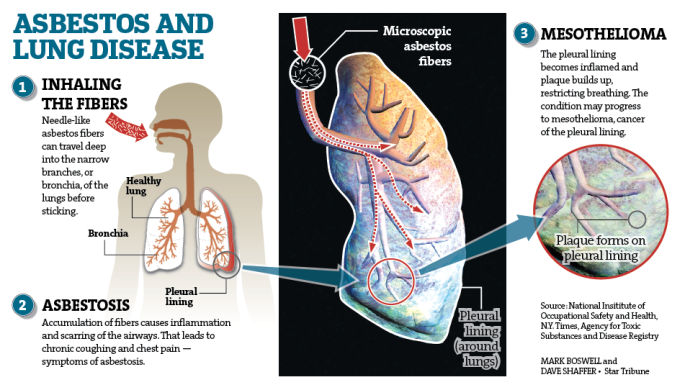 The fibres usually resist and destroy these blood cells, promoting further inflammation and irreversible scarring of the lungs, called fibrosis. There's no known safe level of asbestos exposure. However, it's thought the higher the levels of asbestos and the longer the time someone is exposed to it, the greater their risk of developing problems. Anyone who's exposed to asbestos may develop an asbestos-related illness. Particularly at risk are those involved in the building and demolition industry, the manufacture of asbestos products and asbestos spraying. Asbestos fibres are also carried on clothing, so the families of those working with asbestos and those involved in the laundering of an asbestos worker's clothing may be at risk. Asbestos is now used less and working practices have been developed to protect people from asbestos exposure. The effects of asbestosis don't tend to appear for many years, often between 25 and 40 years later. The main symptom is shortness of breath, initially on exertion but later even at rest. Others include tiredness, a cough, chest tightness and chest pain. Asbestos can cause thickening of the pleura, the membrane that lines the outside of the lung. Often this will only be noted when an x-ray is performed for another reason. If the thickening is severe and widespread, it restricts lung function causing shortness of breath. Mesothelioma is a rare form of cancer that's only caused by exposure to asbestos. It can occur in the pleura, where it may cause shortness of breath or chest pain, or the peritoneum (the lining of the abdominal wall), where it may cause intestinal obstruction. A history of exposure to asbestos, the pattern of symptoms experienced, a chest x-ray and lung function tests are usually all that's needed to make the diagnosis of asbestosis. People who've been exposed are often advised to have regular check-ups because it may take years before lung damage becomes apparent. Although there's no cure for asbestosis, it's important to prevent the symptoms becoming worse by avoiding further exposure to asbestos. Medication can be prescribed to relieve symptoms and improve breathing. Some people with severe problems are given oxygen.